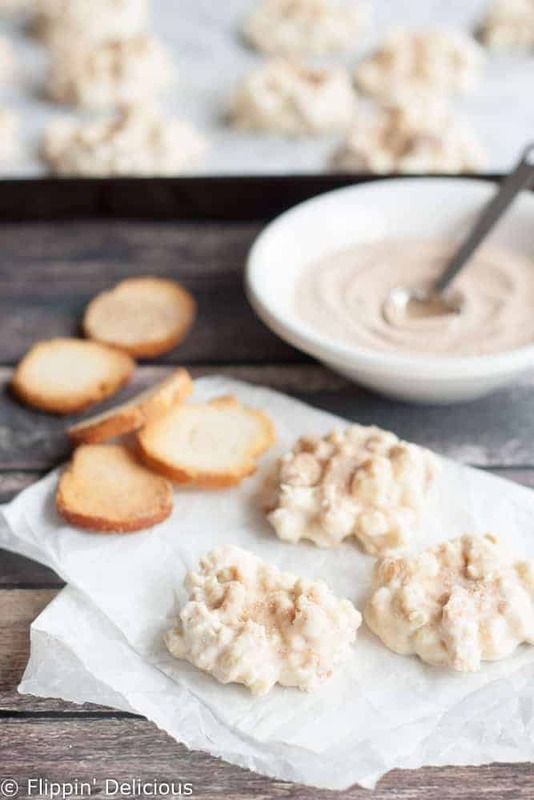 These gluten free no bake white chocolate cinnamon cookies are finished in just a few minutes with only 4 ingredients! The perfect holiday cookie recipe for this busy season. 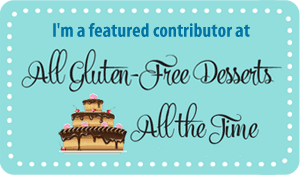 This post is sponsored by Glutino and is a part of a gluten free virtual cookie exchange. As always, all opinions are mine and mine alone. Be sure to check out the rest of the gluten free cookie recipes in the virtual cookie exchange at the end of this post! I could tell you of my holiday woes, but I’d be preaching to the choir. There is the normal, everyday stuff that already keeps us busy. Then you add Christmas parties, holiday shopping, all of the baking and treats for neighbor gifts or school parties. You personally know how busy the holidays are. 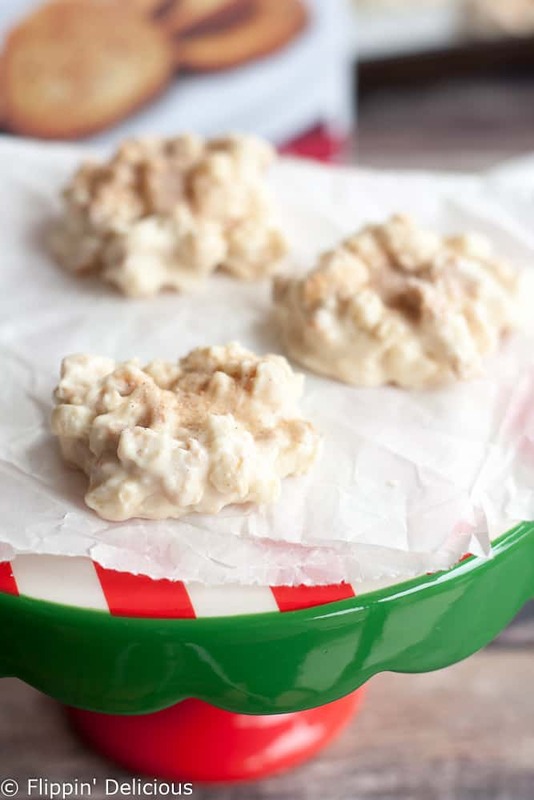 Which is why I made these gluten free no bake white chocolate cinnamon cookies. They are SO easy, and only have 4 ingredients. I think it only took me about 10 minutes to make them too! Such a simple recipe, perfect for those last minute parties or cookie exchanges. They take just minutes to make. You simply melt white chocolate with a little coconut oil and stir in some crushed Glutino gluten free cinnamon & sugar bagel chips, scoop, and sprinkle with cinnamon sugar. The little bit of coconut oil helps the white chocolate to set up firmly with a nice sheen. If you are using a gluten free white chocolate candy coating instead of chocolate chips you can skip the coconut oil. Bagel chips in cookies? It might seem funny at first but the bagel chips add a great crunch in no bake cookies. 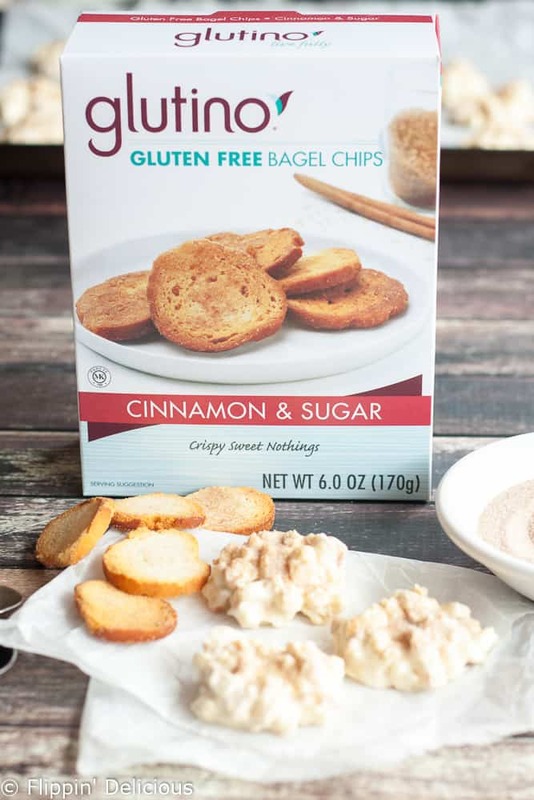 The bagel chips are crisp and lightly sweet, and the cinnamon sugar goes perfectly with the white chocolate. Coarsely crush the Glutino gluten free cinnamon & sugar bagel chips by putting them in a large ziploc bag and crushing them with a rolling pin or kitchen hammer. Set aside ¼ cup of the white chocolate and place the rest in a microwave safe bowl with the coconut oil. Add the crushed bagel chips and stir to combine. Scoop the mixture and place it on the parchment paper. I used my 1½ tablespoon cookie scooper and then gently spread out the cookie a little with the back of the scoop. Immediately sprinkle each cookie with a little cinnamon sugar. There are pictures of several of the steps in the photo below. Not all white chocolate or candy coating is gluten free. Be sure to check the labels on all of you ingredients to make sure they are gluten free. 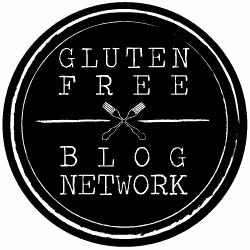 Some other gluten free bloggers have made some festive gluten free holiday cookies as a part of this virtual cookie exchange. Glutino is giving away some great kitchen gear and products! 1 grand prize winner will win a Kitchen Aid Mixer, stone pie dish, baking spatula, mason jar measuring cups and $50 of Glutino products. 9 runner-up winners will win a stone pie dish, baking spatula, mason jar measuring cups and $50 of Glutino products. I can always use more no-bake cookie recipes! These look really easy! Thanks Kelly! They are super easy to make, which is just what I need over the holidays. Such a fun no-bake easy cookie! You would never guess that they are bagel chips while you are eating them. They are just crisp and crunchy! These look so easy! What a unique idea! They are so good too! They’d be the perfect dippers for one of those dessert dips. I’m thinking New Years! Of course, that is if I still have some then. Which is doubtful. SO easy!! Have you ever dabbled in making your own white chocolate? I have wanted to try…but haven;t gotten around it yet. I haven’t tried making my own white chocolate, but I think it would be fun to! Then it could be dairy-free too. I have made dark chocolates with cacao and coconut oil. Those are good! Great giveaway! OH and these cookies sound FAB too! Thank you Sharon! They are delicious and crunchy, I ate one this morning! Thanks Chandice! I thought it was really fun. Will have to look at alternatives before I can make this. Pinning this for later use.